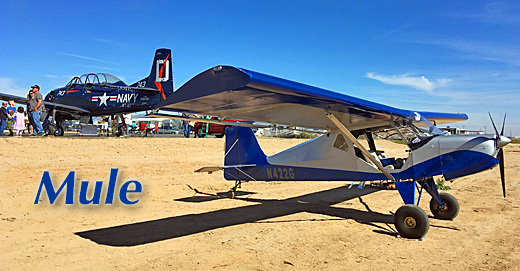 "We are Arizona's newest aircraft manufacturer," said Garrett Komm when we finally located him and his bright blue and silver aircraft. A fan of this particular flying machine had approached me at Copperstate and said, "You gotta go see this airplane. Tell him Russell sent you!" (Thanks, Russell!) After wrapping up a couple other video interviews, Videoman Dave and I left the main exhibit area to seek out Russell's discovery. As we came upon it, parked among other transients to the light aircraft area at Copperstate, we both found it vaguely familiar. Well, it was vague for me. Dave was sure right away. That's because Gair-Planes' Mule started life as the Merlin from Canada and Dave was associated with the project for a time. Garrett had also worked with the Canadian designer so they compared notes for a few minutes. 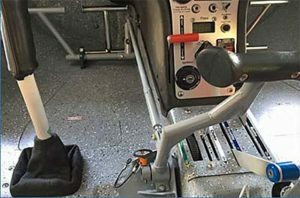 A small, removable step helps you boost yourself into Mule's cockpit. I'd flown one of these for an hour or so many years ago. I've since enjoyed many more, hence my vaguer recollection. Dave had actually worked with the founder of the company, explaining his instant and deeper recognition. (This combination is why Dave and I make a good team; a couple veterans who have seen most of everything in this space, experience that helped us as we made 600-and-counting videos.) Garrett is a Canadian national living in Arizona on a visa so he wants to produce kits and therefore employ some Americans to extend his welcome. It's a common tactic of value and given Mule's low price and durable STOL behavior, Gair-Planes can achieve this goal, forging ahead. Pilots like Russell are happy about that. 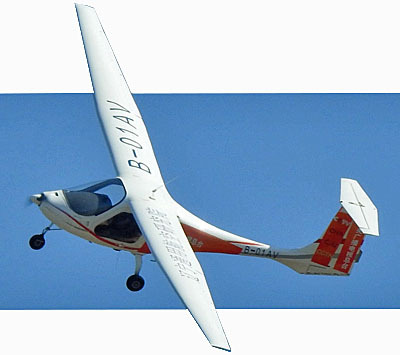 Merlin is a Canadian design introduced in 1990 by John Burch, a Canadian ultralight instructor. In other words it was built for flight instruction in Canada, where landings on unimproved runways would (wisely) be part of regular training. "Merlin was one tough little aeroplane," said Dave Loveman. 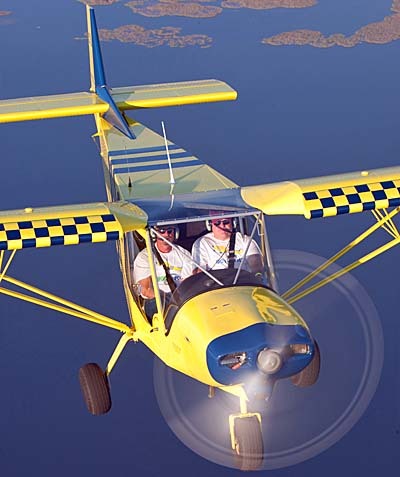 "John Burch was a Canadian ultralight instructor and needed a better aircraft for his flight school. The 42 inch wide cabin is quite comfortable for even the largest of pilots." Mule is a bit wider at 46 inches. After Burch's Canadian operation, Merlin was for a period offered by AeroComp on Florida's Atlantic coast, at the Merritt Island airport. 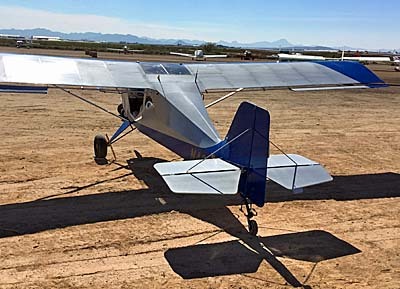 Now Gair-Planes is offering the kit from Arizona, all part of the interesting migration of designs that prove their worth. As with Merlin, Mule is built around a welded 4130 chromoly steel fuselage and tail structure, all fabric covered. Wings use aluminum D Cell construction, with styrofoam ribs. The result was tested by the Canadian creator to +4 and –2 Gs. 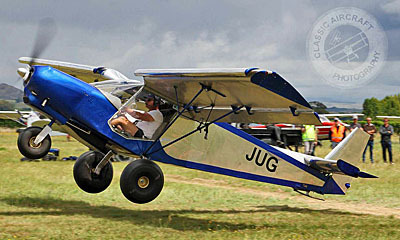 Mule is a taildragger, in a tractor configuration, with side by side seating. Controls are standard stick and rudder with a center Y-stick. "We are not the fastest airplane out there," observed Garrett, "but we believe that we are one of the best for low and slow backcountry flying." 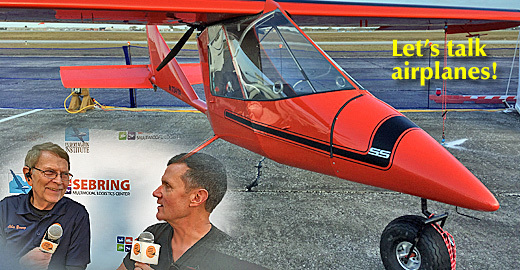 Powered by a Rotax 912, climb rate is 1,000 feet per minute off the runway, said Garrett. 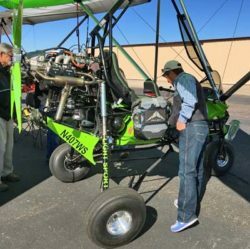 He's using the 912 but the airframe can work with engines from the 65-horsepower Rotax 582 up to 120 horsepower. Cruise is 85 mph, Garrett said, with slow stall below 30 mph. Mule earns its STOL designation by taking off or landing solo in 150 feet. 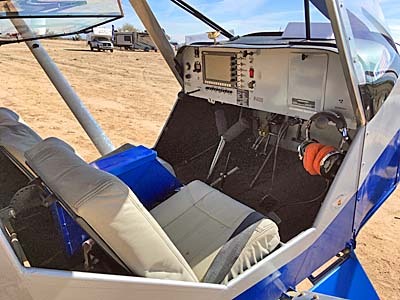 With an airframe kit price of $18,700, adding an engine for a similar amount, plus paint and basic avionics, you should be able to get a Mule airborne for less than $50,000. "Building time is about 400 hours," said Garrett, though agreeing that this can depend on builder experience and how detailed the builder wants to go. 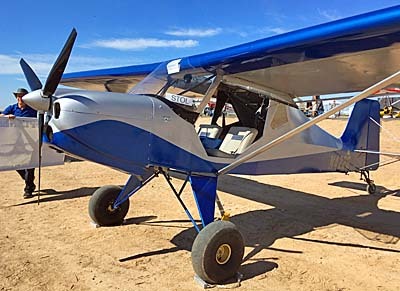 “We are Arizona’s newest aircraft manufacturer,” said Garrett Komm when we finally located him and his bright blue and silver aircraft. A fan of this particular flying machine had approached me at Copperstate and said, “You gotta go see this airplane. Tell him Russell sent you!” (Thanks, Russell!) After wrapping up a couple other video interviews, Videoman Dave and I left the main exhibit area to seek out Russell’s discovery. As we came upon it, parked among other transients to the light aircraft area at Copperstate, we both found it vaguely familiar. Well, it was vague for me. Dave was sure right away. That’s because Gair-Planes‘ Mule started life as the Merlin from Canada and Dave was associated with the project for a time. Garrett had also worked with the Canadian designer so they compared notes for a few minutes. I’d flown one of these for an hour or so many years ago. 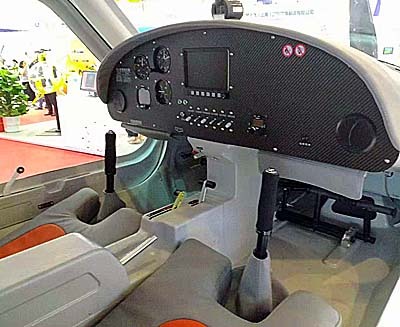 At a major show in China called Zhuhai visitors saw something: a new 6-axis LSA flight simulator. 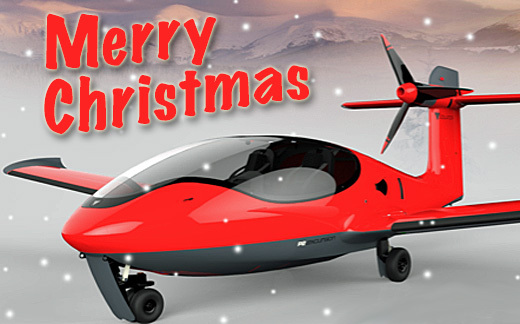 The developer is AeroJones Aviation, the CTLS manufacturer for the Asia-Pacific region. The company exhibited their simulator to a warm reception. General aviation is beginning to develop in China lead by airport construction at hundreds of the country's huge cities. As I've written before, I have no doubt the airports will be built, but actual flying at most of them — by Light-Sport Aircraft or other recreational aircraft — seems somewhere off in the future. China has a massive job ahead. Chinese business people have proven very capable of building many things, but developing a culture of the citizenry flying in light aircraft still has quite a distance to go. However, AeroJones new simulator may help the country take a huge stride forward. Chinese citizens play games, including flight simulators, as much as (or perhaps even more than) Americans do. Sitting at their computer or using a mobile smartphone or tablet is commonplace. They know this activity and it may provide a bridge to people going aloft in an actual airplane like CTLS. Imagine if you had never, ever seen a small plane of any kind. Would you rush to fly it? It's hard for Americans to envision this situation as we have small airplanes everywhere and airports in nearly every town in the nation. 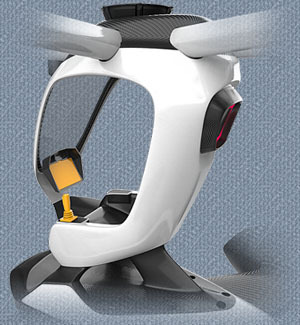 AeroJones may truly be on to something developing their full-motion simulator. “At the Zhuhai Airshow 2018, our AeroJones 6-axis of motion CTLS simulator was shown for the first time to the public,” said Michael Chou, who handles marketing for the company. He reported that reception to the new simulator was very enthusiastic. 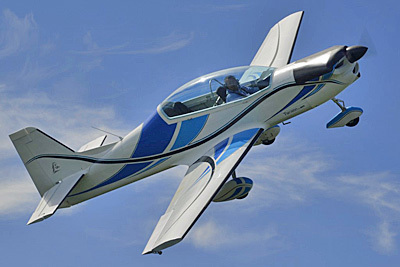 Although having the shortest span of any Light-Sport Aircraft, AeroJones' new full-motion simulator is full-sized and equipped similarly to any deluxe CTLS aircraft. 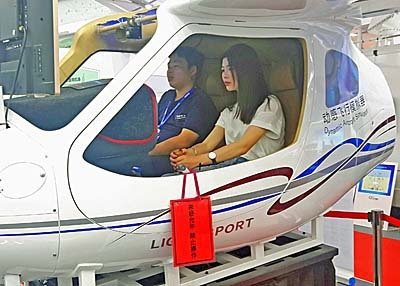 “Our flying CTLS also received lots attention in the show,” said Chou. 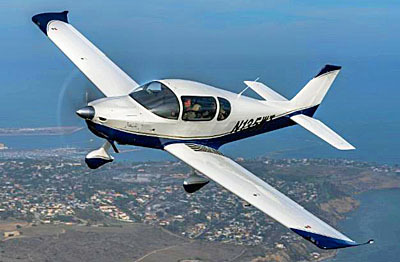 “The market is growing for Chinese general aviation. We visited with many prospective customers from flight clubs and flight schools that expressed interest in the AeroJones CTLS.” “The cabin scale of the full-motion simulator is 1:1 of the flying CTLS,” added Mr. Chou, meaning that the simulator is an exact size copy of the actual LSA. “Our simulator is equipped with two SkyView digital instrument panels designed by Dynon Avionics in the USA. The simulator has dual control sticks and rudders so an instructor can help a student learn the procedures and perform maneuvers. For the general public, it is a great device for entertainment.” “AeroJones Aviation owner Jones Chen was pleased with the response to our aircraft and especially for our unique full-motion simulator,” said Mr. Hsieh Chi-Tai, General Aviation Development Vice President for AeroJones Aviation Technology Co., Ltd. AeroJones is deep into planning for their new aircraft factory in Zhenjiang, China — where, presumably, they will also build the simulator. With the new facility, all manufacturing steps will be easier, less costly, and much more efficient, which will contribute to better values for customers buying the CTLS. 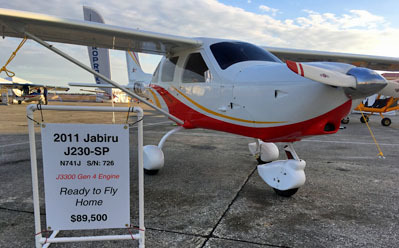 Flight schools or other buyers of the modern and sophisticated CTLS will be able to fly to Dalu General Airport to see the factory and take demonstrations flights to confirm their purchase. At the time the new factory was announced, Mr. Jones Chen said, “We are very pleased about the relationship with leaders of Zhenjiang. We look forward to a long and prosperous relationship." 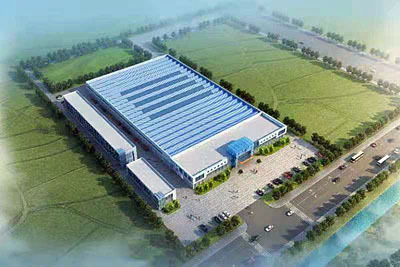 An artist's concept for the new AeroJones factory in Zhenjiang. It has direct access to the Dalu airport. Please let me clarify for readers who may recall seeing the AeroJones brand at American airshows. For a time, it did appear the Taiwan-based company would sell into the USA. However, that plan changed and today, the primary markets for AeroJones Aviation include China, Taiwan, Australia, New Zealand, Indonesia, Malaysia, Philippines, Japan, Korea, and Thailand. Because Flight Design general aviation, the original developer of the CT-series, does not currently market a full-motion flight simulator, this particular product may find its way into western nations. 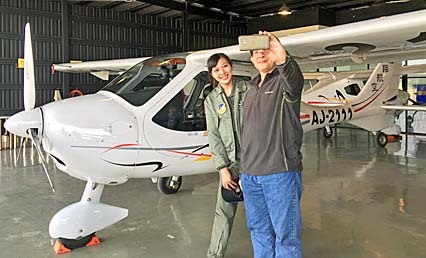 Beyond their aircraft factory in Xiamen, China and the new one to come in Zhenjiang — not far from the well-known megacity of Shanghai — AeroJones also operates a flying field, flight school, and maintenance center at an airfield in Taiwan. 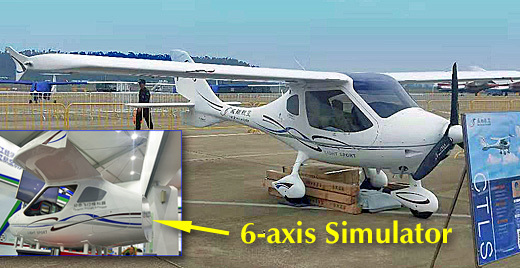 At a major show in China called Zhuhai visitors saw something: a new 6-axis LSA flight simulator. The developer is AeroJones Aviation, the CTLS manufacturer for the Asia-Pacific region. The company exhibited their simulator to a warm reception. General aviation is beginning to develop in China lead by airport construction at hundreds of the country’s huge cities. As I’ve written before, I have no doubt the airports will be built, but actual flying at most of them — by Light-Sport Aircraft or other recreational aircraft — seems somewhere off in the future. China has a massive job ahead. Chinese business people have proven very capable of building many things, but developing a culture of the citizenry flying in light aircraft still has quite a distance to go. However, AeroJones new simulator may help the country take a huge stride forward. First, Simulate — Then, Go Aloft Chinese citizens play games, including flight simulators, as much as (or perhaps even more than) Americans do. On Day 3 of Copperstate at the Buckeye Air Fair, crowds were again strong and the skies gradually cleared for another day of flying in the smoothest air I've felt in some time. What made this extra special was a chance to go aloft in the Flying Legend Tucano Replica, a scaled down version of a well-known Brazilian military aircraft. 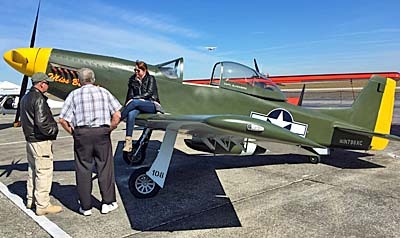 Indeed, the fighter-like shape and paint job of Tucano beckoned convincingly and I went aloft with Flying Legend USA representative, Giovanni Matichecchia …yeah, I told him I'd just call him Giovanni. He grinned and said his last name was tough even for Italians. This capable 27-year-old pilot is off to the airlines one day but is doing a fine job of demonstration flying Tucano for media types like me and potential buyers of this eye-catching machine. Flying Legend's Tucano is a scale replica of well-regarded original. Embraer's EMB 312 Tucano is "a low-wing, tandem-seat, single-turboprop, basic trainer with counter-insurgency capability developed in Brazil," according to Wikipedia. 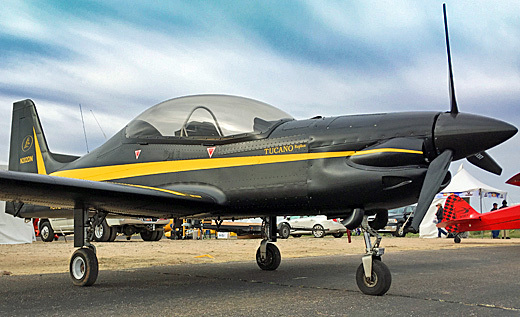 Flying Legend's Tucano is one you can consider owning. 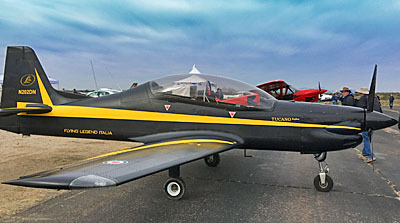 The Italian Tucano uses a supercharged (not turbocharged) Rotax engine, a modification of the well-known brand by an Italian company with good results over eight years of sales. This specialty powerplant produces 140 horsepower and definitely delivered a spirited takeoff. With optional retractable gear and in-flight adjustable prop Tucano is a hot performer. Throughout our maneuvers, Tucano felt exceptionally sturdy in the air. We did benefit from perfect conditions but it was clear this aircraft is tough enough for basic aerobatics as advertised. (We did not do any.) Stalls were surprisingly slow considering how clean the aircraft looks, down into the high 40 knot range. A LSA version should readily meet standards for stall. Handling was very well behaved. I found the stick a mite heavy in roll but it was exceptionally precise. Again smooth air helps but Tucano held even steeply banked 720 turns with ease and a light touch. Trimming was not necessary to hold altitude, even in 45-degree banks. Slow flight was easily controllable suggesting landing would be very manageable. It was and my first touchdown showed this Tucano has very good manners. Throughout all maneuvers, visibility is glorious, a panorama in any direction except straight down. From the aft seat the wing blocked my downward view though it looked better from the front seat where you solo. The downside to that expanse of acrylic is heating in the summer in places like Texas, where Flying Legend USA is based. Additional air inlets are in the works. 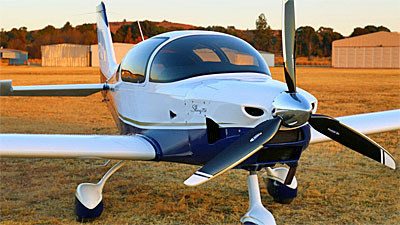 The LSA version of Tucano has fixed gear and prop plus a 100 horsepower Rotax 912. On Day 3 of Copperstate at the Buckeye Air Fair, crowds were again strong and the skies gradually cleared for another day of flying in the smoothest air I’ve felt in some time. What made this extra special was a chance to go aloft in the Flying Legend Tucano Replica, a scaled down version of a well-known Brazilian military aircraft. Indeed, the fighter-like shape and paint job of Tucano beckoned convincingly and I went aloft with Flying Legend USA representative, Giovanni Matichecchia …yeah, I told him I’d just call him Giovanni. He grinned and said his last name was tough even for Italians. This capable 27-year-old pilot is off to the airlines one day but is doing a fine job of demonstration flying Tucano for media types like me and potential buyers of this eye-catching machine. Flying Legend’s Tucano is a scale replica of well-regarded original. 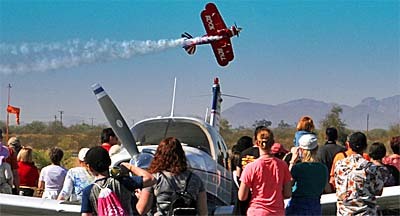 Copperstate Day 2 — Big Crowds Plus Flying Sling TSi with Rotax 915 Power: Superb! I have to admit my pleasant surprise. This tie-up of Copperstate and Buckeye Air Fair might be exactly what is needed to generate a major show in the Southwestern USA. Let me be fair. Other West Coast aviation events have interesting qualities but none has ever risen to the level of AirVenture Oshkosh or Sun 'n Fun. Those two dominate general aviation events. Both are "back East." With big pilot and aircraft populations in California, Arizona, and Washington, why have we no major shows in the West? No one I've asked can explain the riddle but could Copperstate Buckeye Air Fair be the right combination? Only time will tell yet on Saturday, crowds were as thick as Oshkosh, albeit in a much smaller area. 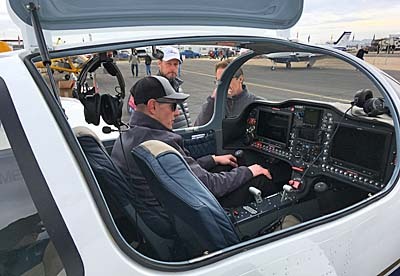 City planners offered an airshow and lots for attendees to look at plus the Copperstate trade show alongside the Buckeye Air Fair gave the public close access to pilots operating all manner of light aircraft. 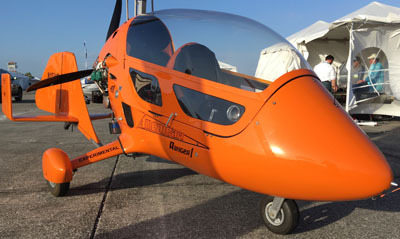 Serious airplane buyers encouraged vendors on Thursday before the public attended. They came out in huge droves on Saturday. Vice Mayor Eric Orsborn, whom I interviewed on video, estimated 15-20,000 people that day. It looked like it and we have video proof. By the way, Eric is not only a city leader, he's a pilot who just earned his ticket. His wife is also pursuing flying lessons and is going through ground school now. If Sunday is equally strong, most will consider this pairing of city air fair with industry trade show to be a resounding success. Vice Mayor Eric said the city was very pleased about the link-up and sees good things in the future. I have to admit my pleasant surprise. This tie-up of Copperstate and Buckeye Air Fair might be exactly what is needed to generate a major show in the Southwestern USA. Let me be fair. Other West Coast aviation events have interesting qualities but none has ever risen to the level of AirVenture Oshkosh or Sun ‘n Fun. Those two dominate general aviation events. Both are “back East.” With big pilot and aircraft populations in California, Arizona, and Washington, why have we no major shows in the West? No one I’ve asked can explain the riddle but could Copperstate Buckeye Air Fair be the right combination? Only time will tell yet on Saturday, crowds were as thick as Oshkosh, albeit in a much smaller area. 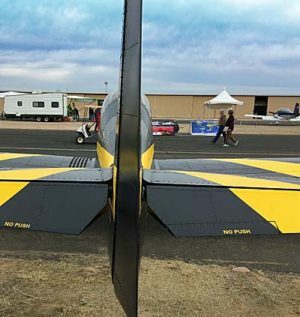 City planners offered an airshow and lots for attendees to look at plus the Copperstate trade show alongside the Buckeye Air Fair gave the public close access to pilots operating all manner of light aircraft. 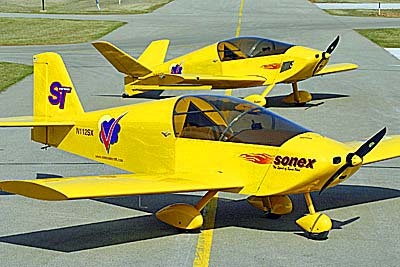 A pair of Sonex aircraft sit on the ramp in Oshkosh, Wisconsin, home airport for this developer of well-priced kits. 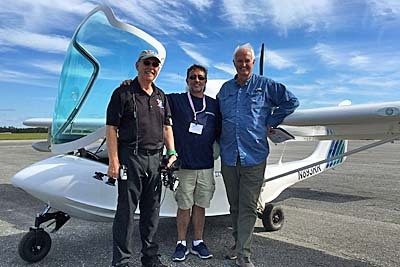 At the recently concluded Sebring Sport Aviation Expo, I heard from a number of pilots and vendors about this website publishing fresh market share data. This clearly has value to anyone in the business but it also brings rewards for pilots trying carefully to choose a new aircraft. Having roamed widely around the Internet to check multiple references, I can confidently state that this information is available from no other source. Even though our information comes from FAA's registration database, as our earlier articles about this renewed effort explained (here and here), the computer records needed some serious massaging to properly interpret a large number of make and model variations. Even a recently retired FAA official told me his former office has already begun using our Tableau Public presentation because the data is more user-friendly. Yet again, I am motivated to give Steve Beste an enormous "Thank you!" for his dedicated effort to take FAA's data, make complete sense of it (no small task), and to then work with the folks at Tableau to make this information available to you. Even better, you can adjust the data to your liking in ways I never envisioned with our earlier years of reporting these facts. 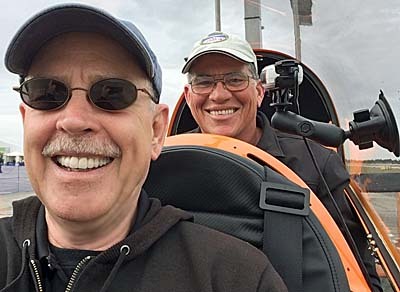 Thanks to Steve and his impressive skill set — and his willingness to spend his personal time — we now cover every aircraft registered since 2005, a year we picked because in April of that year FAA issued the first two Special Airworthiness Certificates (to Evektor's SportStar and Flight Design's CT). 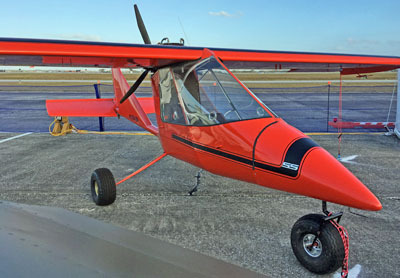 Since 2005, more than 8,000 aircraft have been registered and that does not include about 4,000 former "fat ultralights" that FAA mandatorily turned into one-time Experimental LSA. Neither do we attempt to count aircraft with Standard (Part 23 or CAR 3) certification, which can be flown using a Sport Pilot certificate. Because a large number of you visit this website via your smartphone, you can now see images that fit your screen better (nearby image). Given a wide variety of phone sizes, screen resolutions, and browsers, not every phone will look like these images but the data is much more accessible via smartphone than it was when we launched late last fall. Of course, iPads and desktops or laptops with their larger screen real estate can see the data more comprehensively, but even on those larger devices or computers, the data now make more sense thanks to Steve's continuing effort to improve the look. The "This-Yr Ranking" screen may be one of the most viewed elements of the page because it reveals sales interest for the present year …when pilots might be preparing to hand over a deposit. Steve noted, "The current-year rank tables now show three years instead of just one. This will be important when the first 2019 data is presented. The rankings may then appeared skewed because they will display only one quarter of a year. Showing the extra years will give useful context." Hint: Turning your smartphone or tablet horizontally may reveal more information, depending on your device. One last point: If your interest is limited to kit-built or fully-built Special LSA, you can adjust Tableau Public to show only those types by clicking in the "Cert Group" blue box (image). By default the lists show numbers for both types; click or tap to see only the ones you want. Note that this is somewhat different than "Certification," which offers more detailed ways to narrow the field solely to aircraft types that interest you. The effort Steve and I have made together (well, mostly him; I primarily gave feedback or specific knowledge of aircraft) attempts to give pilots, businessmen, and government more data about the sector of aviation we enjoy most. Any comments about how we can make this even more useful will receive careful attention. 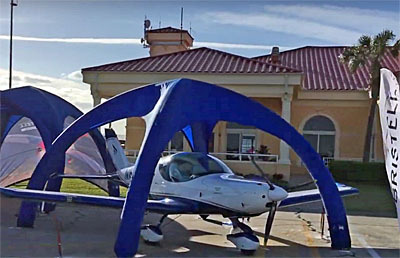 At the recently concluded Sebring Sport Aviation Expo, I heard from a number of pilots and vendors about this website publishing fresh market share data. This clearly has value to anyone in the business but it also brings rewards for pilots trying carefully to choose a new aircraft. Having roamed widely around the Internet to check multiple references, I can confidently state that this information is available from no other source. Even though our information comes from FAA’s registration database, as our earlier articles about this renewed effort explained (here and here), the computer records needed some serious massaging to properly interpret a large number of make and model variations. Even a recently retired FAA official told me his former office has already begun using our Tableau Public presentation because the data is more user-friendly. Yet again, I am motivated to give Steve Beste an enormous “Thank you!” for his dedicated effort to take FAA’s data, make complete sense of it (no small task), and to then work with the folks at Tableau to make this information available to you. Sebring Day One was true to form for the 15th running of this grandaddy of Light-Sport and Sport Pilot Kit shows. Airport manager Mike Willingham told me opening day attendance was better than opening day last year. He and the entire Expo team certainly benefitted from good weather, a tad windy, but blue skies and temperatures hitting 80° F (27°C). 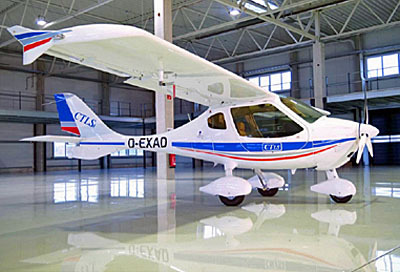 Czech Sport Aircraft SportCruiser LTE represented by Cruiser Aircraft. Videoman Dave and I recorded several new video interviews for you. One of the first will be our classic race-around tour of exhibits on opening day. We also talked to many in the business. The government shutdown appears to be having some effect on industry. 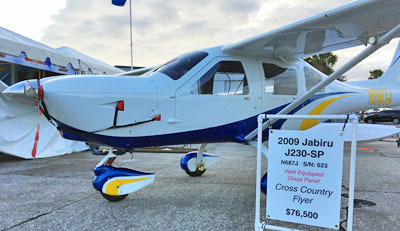 One example regards FAA inability to make inspections so a vendor can get the Special Airworthiness certificate needed to complete delivery of a new SLSA (meaning final payments cannot be collected, no small matter to many LSA or SPE kit enterprises). However, few vendors actually introduced the topic suggesting the bad news may be localized. Titan Aircraft's Tornado, looking super sleek even with tundra tires. Overall though, we heard a continued positive outlook as we surveyed at DeLand Showcase in early November last year when many in the business told us about the good year they had just finished. Volunteer Army — As is necessary but not taken for granted was a large group of helpful volunteers. Airshows, even the giants like Oshkosh and Sun 'n Fun, could not happen with such willing help, often people taking vacation time to put in many hours helping the details turn out right. THANKS to each and every one of them! 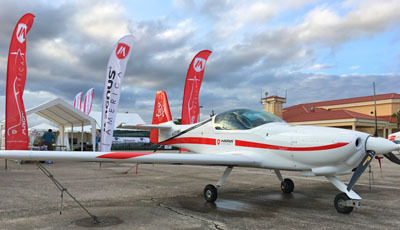 Cruiser Aircraft, the importer for Czech Sport Aircraft, offered their new SportCruiser LTE, a lighter, simpler, much lower cost version of the popular Light-Sport Aircraft. 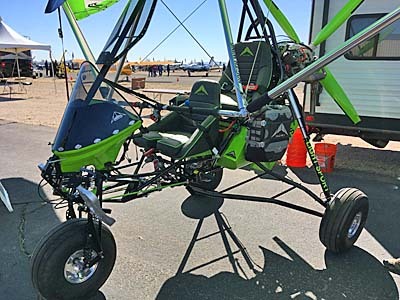 Powered by a Rotax 912ULS2 100 horsepower engine the LTE model has one Dynon HDX screen, cloth seats, and reduced weight. 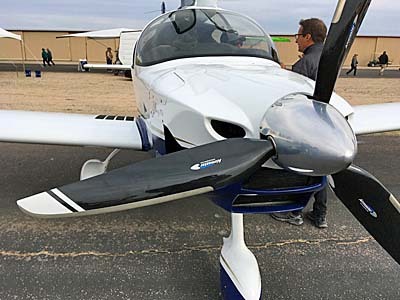 Marketing and sales manager Josh Scheid said the combination, priced in the low $140s, is aimed at flight schools looking to offer a modern new aircraft to students and reap very low operating costs. "A lot of primary training finds students throttled down doing patterns and burning only 2.5 gallons per hour of lower cost fuel," Josh noted. He continued saying they can increase equipment to suit a flight school's need including certified Garmin gear to allow IFR flight training. 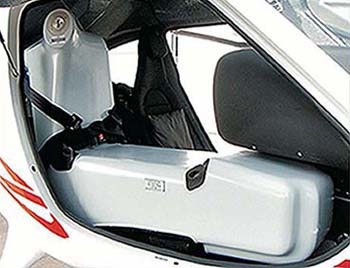 SilverLight Aircraft's American Ranger AR1 gyroplane with full enclosure. 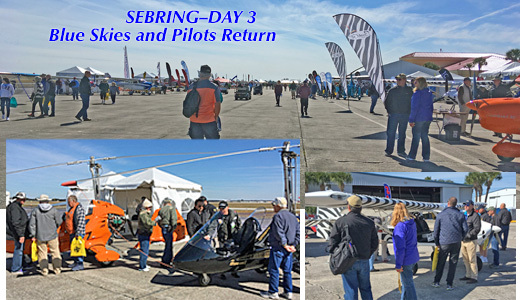 Sebring Day One was true to form for the 15th running of this grandaddy of Light-Sport and Sport Pilot Kit shows. Airport manager Mike Willingham told me opening day attendance was better than opening day last year. He and the entire Expo team certainly benefitted from good weather, a tad windy, but blue skies and temperatures hitting 80° F (27°C). Videoman Dave and I recorded several new video interviews for you. One of the first will be our classic race-around tour of exhibits on opening day. We also talked to many in the business. The government shutdown appears to be having some effect on industry. One example regards FAA inability to make inspections so a vendor can get the Special Airworthiness certificate needed to complete delivery of a new SLSA (meaning final payments cannot be collected, no small matter to many LSA or SPE kit enterprises). However, few vendors actually introduced the topic suggesting the bad news may be localized. 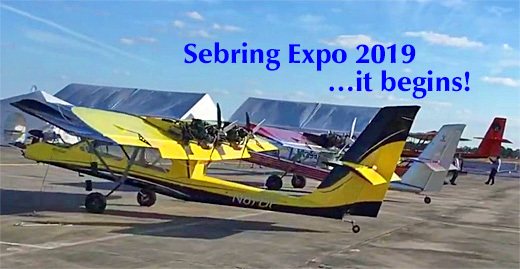 Sebring Sport Aviation Expo 2019 — I’m here. Where are you? Weather looks good for the opening tomorrow here in Sebring, Florida, where temperatures were in the mid 70s (23 C). Blue skies prevailed although the air was bumpy according to several who flew airplanes in for display. While a good many airplanes are already here, an equal number were still not on the grounds at 6 PM, so some hustling will have to occur. …and it will! I attend seven or eight airshows every year. I’ve done this for many years. I’m here to assure you that the night before opening, the place is utter pandemonium with no possible hope in sight of having everyone in position and ready for business by morning. It can’t happen. …yet it does! One of the most marvelous transformations to be seen is a lonely expanse of concrete ramp turning into a colorful, energetic, ultimately cool place to hang out, look at lots of pretty airplanes of all kinds, talk flying to your old pals and new friends, catch a forum, participate in a work shop, take a demo flight if you’re in the market — heck, take several flights. Update 1/15/19: Thanks to reader feedback — a resource we value very highly — we have updated our statistics to correct another naming challenging. "Zodiac" turned up 53 more registrations since 2005: 52 601s and one 650. "Of the 53 additions, four were registered in 2018. That bumps our total fleet to 8,027," wrote Steve Beste. Check Tableau Public for the latest data. —DJ "What about my plane," a number of you asked? "I didn't see [XYZ brand] of aircraft," a few others wrote. "How come you didn't include what I fly," several inquired? You spoke (or wrote). We listened. The result? 7,974 aircraft (up from 6,305) is our refreshed count of all Sport Pilot/Light-Sport Aircraft flying machines registered in America. My advisor and consultantant in this deep data dive, IT expert Steve Beste and I decided to enlarge the "universe." 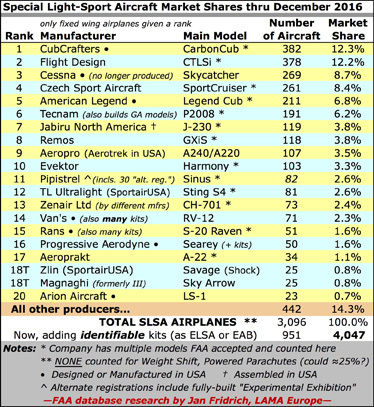 While sticking to the 2005 date when FAA accepted the first SLSA, we can now broaden the aircraft registration database search to include brands like Kolb, Quad City, Sonex, Titan, Murphy, Aero Adventure, Sport Performance and more, plus additional kit aircraft models from companies that do both SLSA and Experimental Amateur Built (EAB) deliveries. If you think we missed any, please let us know. Clarifying, this decision means we also include models from brands previously included but which models never went the ASTM standards compliance route. Go Exploring — ALL the Aircraft! To go roam around the ocean of info about light aircraft, click or tap to this NEW Tableau Public page*. On it you will find the familiar "Dashboard" as you arrive at the website. At the top of the page, look for a row of tabs. You will now find two new tabs labeled, "This-Yr Ranking" and "All-Yr Ranking." I think they are pretty self-explanatory. You can still tweak these depictions any way you wish. For example, once you click on the "This-Yr Ranking" tab you will see two tables. One has a ranking by brand only. The right-hand table has ranking by model, that is, the most registered models. Then, you can go to, for example, the third blue box on the left edge and click off Kit/Other to see only SLSA or click off SLSA to see only Kit/Other entries. The larger blue box above helps you focus on one or more selected brands. Click off "(All)" and then pick the brand or brands you want to examine. Likewise you can also select a type of aircraft (top box) or a method of FAA approval ("Choose Certification" in the fourth blue box), or zero in on amphibious aircraft in the lowest blue box. Back on the Tableau home page, some of you found — and apparently enjoyed; we heard from several of you — that you can go find your own aircraft. Every single one of the 7,974 aircraft making up this review can be viewed. Pretty cool, huh? Simply put, you asked and we want to be responsive. We also want to include ALL aircraft that a Sport Pilot (or someone using a higher certificate to exercise the privileges of Sport Pilot) may fly. I think we have all of them now, but if we find more, we will include them in ongoing reporting. Kolb is a brand now counted in our more inclusive tally. EABs and ELSA — while not demonstrating compliance to ASTM standards — are still very legitimately part of what this website endeavors to cover. Our tagline is "News & Video on Light-Sport Aircraft, light kit aircraft, and ultralight aircraft" and we mean to cover all those types. Of course, we cannot count Part 103 ultralights as they are never given N-numbers but we want to gather all the other appropriate producers and owners in our tent. 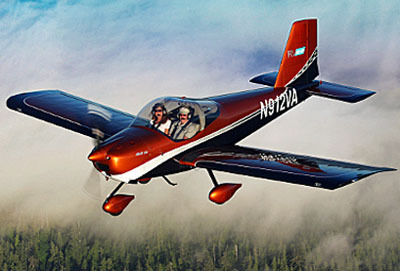 New phrase: "Sport Pilot Eligible Kits" — which I will start abbreviating as SPE Kits — denotes kit-built aircraft, either Experimental Amateur Built (EAB) or Experimental, meaning kit, Light-Sport Aircraft (ELSA). 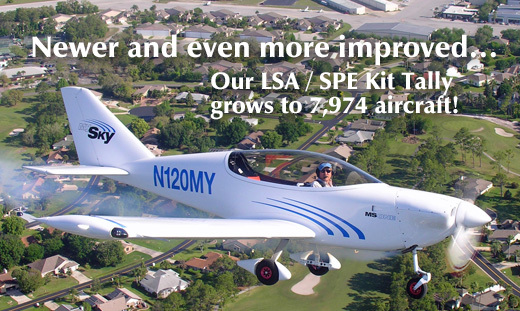 We only count kits, or SLSA, after 2005 as that's when the first SLSA was accepted by FAA. Before that, we had no Sport Pilot certificate, so no kit aircraft model could consider itself Sport Pilot Eligible. Steve Beste and I believe our current Tableau Public page title — "Light Sport Aircraft, Sport Pilot Eligible Kits, and Modern Gyroplanes" — best reflects the energy, diversity, design variety, and uniqueness of this sector of aviation. Our former, familiar chart of aircraft. Good as it was, we left out too many aircraft and have now solved that shortcoming while adding more groups and models. One More Thing: Of personal satisfaction to me, this refreshed effort strengthens a claim in this chart that the USA has about 13,000 LSA or LSA-like aircraft. One difference between the 8,000 we can accurately count and which appear in Tableau Public are 4,000 or so "fat ultralights" that were converted to ELSA, a program that ended in 2010. The small difference still remaining can mostly be filled with Part 103 ultralight vehicles, so that 2015 survey looks even more solid and reliable. I wrote "accurately" and we do believe we have done this correctly. 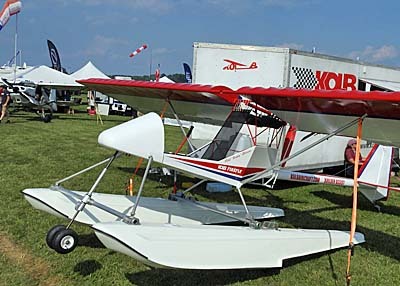 However, when you get into kits the problem can be more difficult because a kit-built aircraft may be registered with the model name "Bob Jones Flyer," when in fact it was an airplane built from an Avid Flyer kit but modified in ways that our theoretical Bob wanted to immortalize by assigning his name to the model. That's perfectly OK with FAA but makes identifying it somewhat harder. Nonetheless, we think the new-and-improved list on Tableau Public is now even more informative. This information is not well covered by anyone else but we felt it was worthwhile and we hope you agree. * Note that Tableau presently works best on a desktop or laptop computer with a larger screen. Tableau arranges some of the data for tablets and somewhat less for smartphones as insufficient screen area exists to portray it all. Steve will be working on these mobile device presentations soon. Update 1/15/19: Thanks to reader feedback — a resource we value very highly — we have updated our statistics to correct another naming challenging. “Zodiac” turned up 53 more registrations since 2005: 52 601s and one 650. “Of the 53 additions, four were registered in 2018. That bumps our total fleet to 8,027,” wrote Steve Beste. Check Tableau Public for the latest data. —DJ “What about my plane,” a number of you asked? “I didn’t see [XYZ brand] of aircraft,” a few others wrote. “How come you didn’t include what I fly,” several inquired? You spoke (or wrote). We listened. The result? 7,974 aircraft (up from 6,305) is our refreshed count of all Sport Pilot/Light-Sport Aircraft flying machines registered in America. My advisor and consultantant in this deep data dive, IT expert Steve Beste and I decided to enlarge the “universe.” While sticking to the 2005 date when FAA accepted the first SLSA, we can now broaden the aircraft registration database search to include brands like Kolb, Quad City, Sonex, Titan, Murphy, Aero Adventure, Sport Performance and more, plus additional kit aircraft models from companies that do both SLSA and Experimental Amateur Built (EAB) deliveries. Using a new service that our associate Steve Beste engaged, check out the "Dashboard" look at the LSA industry at Tableau Public. At a glance, view a quantity of information you've never seen before. You will find colorful charts, lists, and maps but the truly great aspect of this is that you can modify what data shows with a few clicks or taps. You can rearrange the data to your interest and the charts will change to depict your selections. For those focused on market share ranks such as this article relates, use this Tableau Market Share Rank for full lists. (Note that the two Tableau links present the data differently. Further note that so much info is available at these links that smartphones will be challenged to show it all.) All data is up-to-date through the end of 2018 — which is by far the fastest we've ever presented this information. Through a significant investment of time, Steve made this new dataset easier to compile, so that we can now report more frequently than in the past. Unlike other groups, we do not rely on company reports of sales, billings, or deliveries. 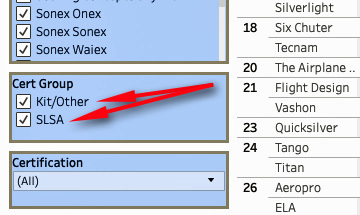 Instead we go direct to FAA's aircraft registration database, the folks that issue N-numbers. As always, we advise you this information will not precisely match what a company may report for their sales but over time, the two sets of numbers should become very close. 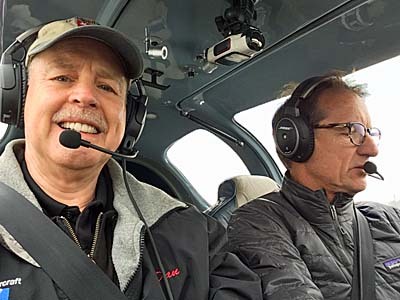 Using professional grade tech skills, Steve added his personal interest in light aviation to create a wonderful, fresh resource. You can read in precise language how he arrives at the numbers we now report. Steve and I went back and forth creating rules to collect the right data from FAA's database and we are satisfied that the current system represents all companies and brands as fairly and consistently as possible. In the interest of accuracy, we are keen to hear from any producer that can improve our information (note that Tableau visitors can identify every aircraft we counted if you care to drill that deep). Because this data display is so different and so comprehensive, we will present additional articles on using this new resource. Now, let's get to details that readers often seem to enjoy. 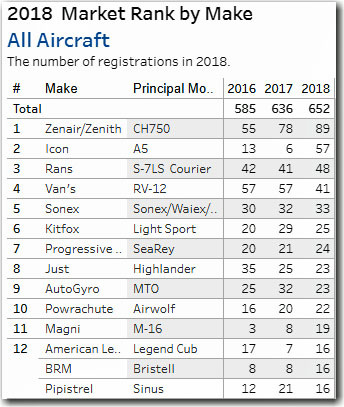 What aircraft registered the best numbers for 2018? What aircraft are the most popular since LSA were introduced? It's all here and much more. Big Numbers First — For our categories of "Light-Sport Aircraft, Light Kit Aircraft, and Modern Gyroplanes," the total swelled to 6,305 U.S. Aircraft Registrations, a much larger number than our last report (with data through 2016). We report details in two primary ways for two primary periods. The periods are "All-Fleet," meaning all LSA or other Sport Pilot-Eligible aircraft that have been registered since 2004 when the rule was released; and, "Calendar Year" meaning the January to December period of the previous year. We have been doing both for several years but our reports were confined to fixed wing or "Airplane" Special Light-Sport Aircraft. That is now changing to a broader view that includes all registrations (see next). All-Fleet Rankings — Our familiar category of fully-built SLSA are slightly more numerous (3,245/51%) than Kit/Other (3,060/49%), for a total fleet of 6,305 aircraft of all types, SLSA and kit. 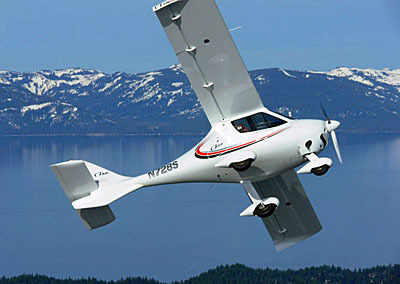 Among SLSA builders of ready-to-fly aircraft, Flight Design returned to its lead position in All-Fleet at 328 aircraft, followed by Czech Aircraft Works (271), CubCrafters (245), and Tecnam (203). Trailing these leaders are American Legend (194), Jabiru (115), Remos (107), Progressive Aerodyne (97), Aeropro/Aerotrek and Pipistrel (96 each), and Evektor (89). See all brand ranks here. (Note Cessna was omitted after the company ceased selling their Skycatcher and destroyed all unsold examples.) In the Kit/Other category, Zenair/Zenith (616) leads Van's Aircraft (531) and Rans (436). The trio of leaders are well ahead of the next tier that includes AutoGyro (167), Progressive Aerodyne (153), CubCrafters (144), Kitfox (119), Powrachute (110), Just Aircraft (102), and Arion (77). Dig deeper here. For SLSA or kits, our rule is to count only aircraft models that have ever declared compliance to ASTM standards and been accepted by FAA. "All-Fleet" counts cumulative registrations since 2005, when the first LSA model was approved, essentially every aircraft that meets our formula. Read our prior article about the work behind the numbers. Calendar 2018 Rankings — Last year, kits slightly beat Special LSA 298 (50.6%) to 291 (49.4%) for a total of 589 aircraft registered. 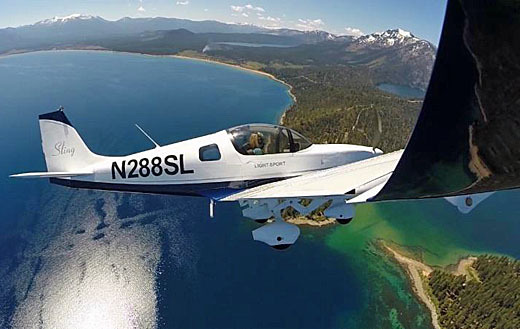 Calendar-year leader, Icon Aircraft logged 57 new ready-to-fly SLSA registrations. 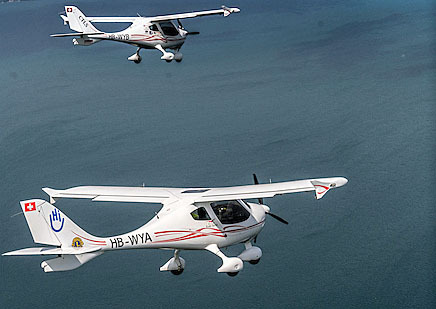 They were trailed by Progressive Aerodyne (21) and BRM Aero (15 Bristells), which tied with Pipistrel. Evolution trikes and American Legend tied (14), followed by Czech Aircraft Works (13), Flight Design and Tecnam (12 each), and The Airplane Factory with 9 Slings. See the whole list here (then click the box to show only SLSA). 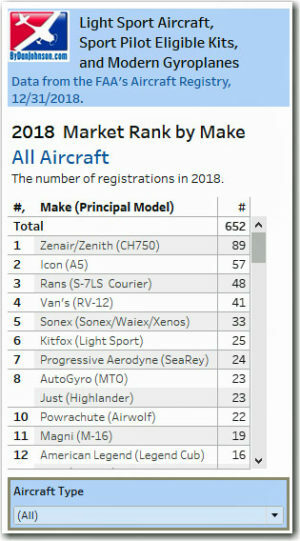 Among kit builders, Zenair/Zenith lead with 75 units registered followed by Van's (44), Rans (35), AutoGyro (24), Magni Gyro (20), Powrachute (19), and SilverLight (12). See the whole list here. Above, we reported fully-built aircraft separately from kits and other types in this post but you can combine them using Tableau. You can also arrange in several other ways or look at a single or few brands. Both fully-built LSA and kit aircraft — using our ASTM compliance qualifier — can be flown by someone using a Sport Pilot certificate. 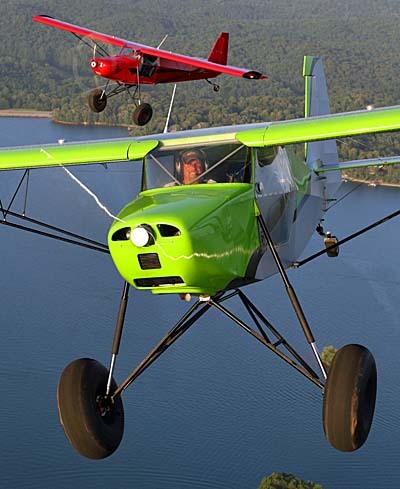 Therefore, we include all LSA-like aircraft that are technically not a Special Light-Sport Aircraft — Experimental Amateur Built kits, for example — as "Sport Pilot Eligible (SPE)," a term coined by a former EAA representative, Ron Wagner. 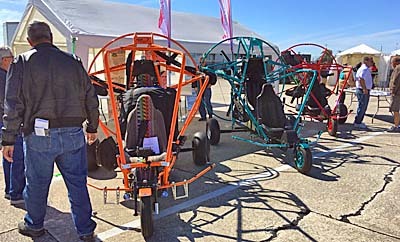 Not only can we rank Special LSA and SPE kit builders separately — as we should; they are very different business models — but we trust you observed that we can also include weight shift control "trikes," powered parachutes, motorgliders, Lighter-than-Air, all the classes of LSA beside fixed-wing airplanes. We further accommodated modern-style gyroplane as SPE kits because they are strong sellers could qualify as Special LSA if FAA decides. We were never able to include all aircraft types in the past due to data entry challenges that Steve Beste solved by his rigorous definition and execution of how we collect the numbers. See his explanation here. You are free to comment on this technique, but rest assured we discussed this at some length before arriving at our current methods. Steve Beste poses in his HKS-powered trike. We hope you appreciate the monster amount of work Steve did to assemble all this info, go through iterations to be sure we had it right, and then to create the Tableau presentation. 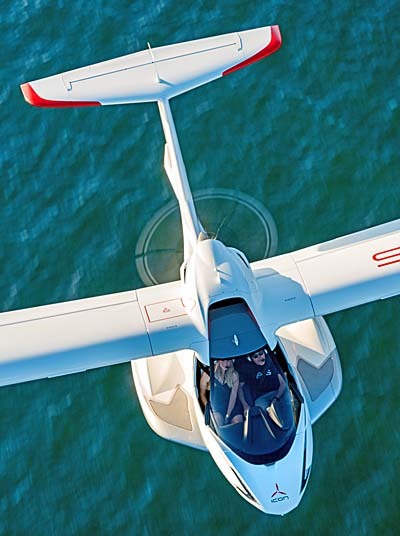 If you like Light-Sport Aircraft and if you like statistics, you are going to love this article. * Our wholly refreshed look at aircraft registrations marks the return of our popular market share rankings and now includes much more information. We also provide more aircraft classes in various tables and charts and much of this is user-configurable. Yet, as late night TV advertisers might exclaim, “That’s not all. It gets even better!” You have always been able to consume all our market share info that includes articles about the industry and enterprise of light aviation conveniently grouped on its own page. With the relaunch of this popular and vital component of ByDanJohnson.com, you gain new ways of looking at the information. 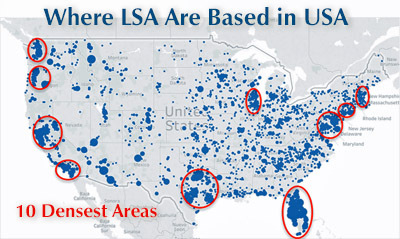 Let’s call it LSA Market Info 2.0 Introducing Tableau! Using a new service that our associate Steve Beste engaged, check out the “Dashboard” look at the LSA industry at Tableau Public. Brave New Year — Will Aviation Finally See the Biggest Change Since Orville and Wilbur? Throughout the 115 years since the Wrights took their Flyer into the skies for the first time, aviation has enjoyed remarkable progress. Wing design, engine design, instrumentation changes, safety enhancements… we have witnessed many dramatic changes in how aircraft ply the skies and do so with increasing efficiency and with less danger to occupants or those on the ground. All of us who enjoy flight know much about this, but things are changing and perhaps fast enough to push many of us current-aviation experts into a discomfort zone. As you have seen on this website and just about any media outlet reporting on new developments, multicopters are looming ever larger on the horizon. More and more startups — many funded with tens or even hundreds of millions of dollars! — are jumping into the game. Huge aviation names such as Boeing and Airbus are deep into work on new-style flying machines. Some have multiple prop-rotors. 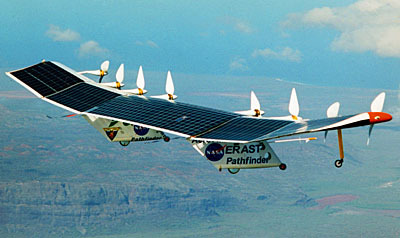 Other use pivoting wings with multiple power plants. Nearly all are pure electric though hybrid systems are used and a few are proposing hydrogen-fuel motors. None of this may interest you, the present-day pilot who loves your light aircraft with its fixed (or not) wings and gasoline engine. Few, including me, believe our more commonplace flying machines are going away anytime soon. Batteries remain the weak link in the chain. However, for short-range urban transport, multicopters may be unstoppable. Such transportation is the goal of Lift Aircraft, a Texas startup that hopes to change the way people travel. 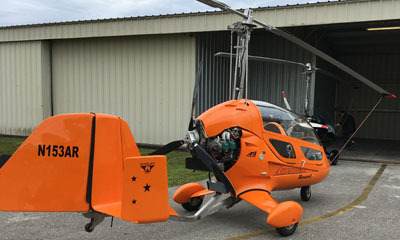 An article in an online publication called Motherboard stated, "On a small airfield northwest of Austin, Lift Aircraft is testing ultralight aircraft for personal travel at short distances. 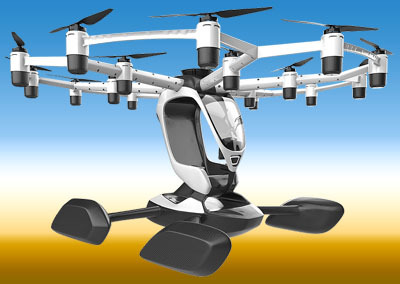 [Lift's Hexa is] a vertical take-off and landing system that uses 18 propellers powered by 18 electric motors to move a person across the sky." “We’re not trying to solve the problem of flying long distances,” Matt Chasen, CEO of Lift Aircraft, told Motherboard. “We’re focused on short hop flights in dense urban areas.” Lift's creation is different than the others in some ways and similar in others. My eye was instantly caught by the test flights in a video that shows a pilot controlling the aircraft using a conventional side-stick. Lift has also listed many features they believe provide safe operation including something they call an Autonomous Ballistic Parachute that uses multiple ballistic devices to provide effective operation, they say, "as low as 10 meters (33 feet)." If I am honest, I can see myself flying in one of these multicopters one day. They might be highly enjoyable with super maneuverability, no airport needed, fantastic visibility, relatively quiet operation, and the chance to hover over a scene of interest. This may be so long coming to fruition that I will never see it …but I wouldn't bet on it. 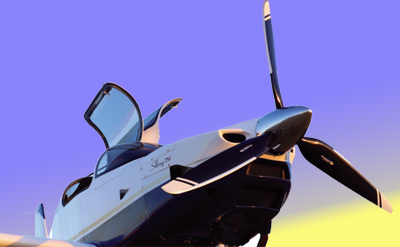 For more info, watch this professionally done video about the Lift aircraft. It includes flying scenes. Infotech + Aircraft = Multicopters What Happens When Infotech Meets Air Traffic Control? According to the US Federal Aviation Administration (FAA), there are about 5,000 passenger aircraft in the sky at any given time, which require 521 aircraft towers, 25 air route traffic control centres, and 6,000 airway transportation systems specialists to coordinate. Meanwhile, the FAA also predicts that the number of unmanned drones registered in its database could surge to more than 6 million by 2021—a fleet of robot that will have to be taken into account when we’re divvying up the skyline. "Divvying up the skyline" where skyline means airspace sounds rather threatening to current pilots. Many pilots have told me they worry about drones or multicopters interfering with the enjoyment of their aircraft, or worse, causing safety problems. Those concerns may be real but the new flying machines identify the weakness in our current ATC system, great as it has been for aviation safety. It simply takes so many highly-paid controllers with hundreds of facilities and a need for ever-increasing equipment sophistication. That paragraph quoted above sends a message. ATC depends on up to 6,000 workers to move 5,000 aircraft around the skies safely. Imagine millions of new flying machines and the old system begins to look creaky. Already, many criticize FAA for using out-dated computers and other equipment and federal employment system that creates high costs. Can the tech world improve on this? Every day, the FAA's Air Traffic Organization provides service to more than 43,000 flights and 2.6 million airline passengers across more than 29 million square miles of airspace. See this FAA page for more infographics on services FAA performs. That, too, may be changing. Motherboard reported, "NASA is already developing an air-traffic control framework that could track unmanned flying cars that fly under 500 feet. As reported in Skift, the NASA system is meant to be automated. [NASA will] finish its research by 2019, and hand over ideas for the FAA to implement no later than 2025." A Brave New World could start in 2019. Throughout the 115 years since the Wrights took their Flyer into the skies for the first time, aviation has enjoyed remarkable progress. Wing design, engine design, instrumentation changes, safety enhancements… we have witnessed many dramatic changes in how aircraft ply the skies and do so with increasing efficiency and with less danger to occupants or those on the ground. All of us who enjoy flight know much about this, but things are changing and perhaps fast enough to push many of us current-aviation experts into a discomfort zone. 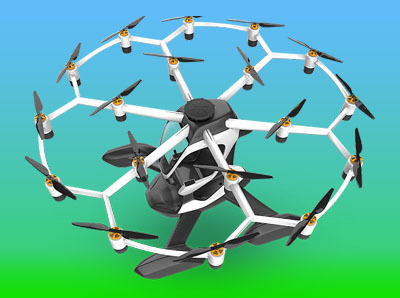 As you have seen on this website and just about any media outlet reporting on new developments, multicopters are looming ever larger on the horizon. More and more startups — many funded with tens or even hundreds of millions of dollars! — are jumping into the game. Huge aviation names such as Boeing and Airbus are deep into work on new-style flying machines. 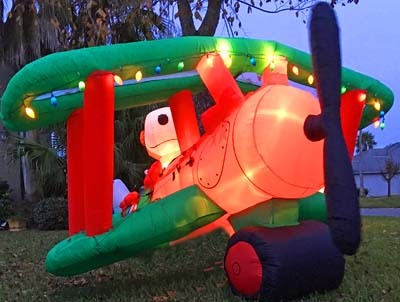 Snoopy the biplane-flying pooch decorated the yard of one of my neighbors. 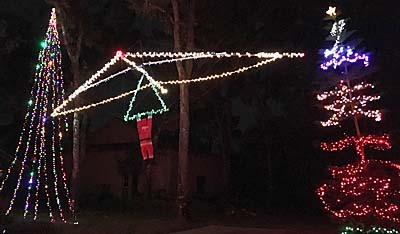 In the flying community where I live, many of these can be seen on an evening tour of Christmas lights. As pilots clear the skies so Santa and his flying reindeer can go about their mission, it seems fitting to offer a word of thanks to all of you who have frequently visited this website. Our surveys show more than 65,000 Light-Sport Aircraft and LSA-like aircraft around the globe and we are proud to reach most of these pilots at some time every month. Pilots have often told me that I have the best job in the world and they may be right. Certainly I enjoy what I do and hope it shows on this website and in the hundreds of videos on which I have interviewed talented people or reviewed aircraft. See the best of them here and all of them (and more) on Light Sport and Ultralight Flyer. 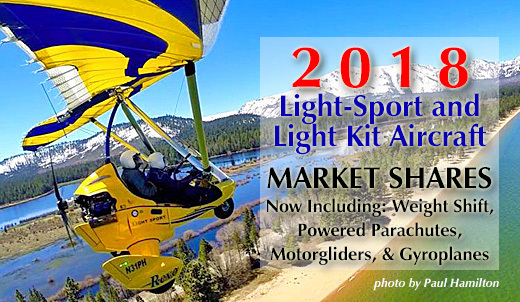 As 2019 approaches, we near the 15th anniversary of the Light-Sport category and the Sport Pilot certificate. As we have since before the category was created by FAA in September 2004, we will continue to report on all the light aircraft that amaze you and us and we aim to fly as many as possible. Hang glider pilots will wonder why Santa is hanging from the base tube but as one who enjoyed this kind of flying for many years, I was simply glad to see one included in Christmas decorations at my home airport. Each year, we attend a number of airshows and hope to see you at one or more of them. 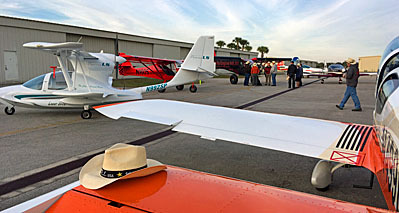 The nearby scenes are but a couple of the many airplane-oriented holiday themes at the wonderful residential airport that I call home — Spruce Creek Fly-In (7FL6) near Daytona Beach, Florida. I'm happy to share these to keep you in the spirit of the season. Besides the great airplanes I am privileged to fly and report, I have the opportunity to meet many fascinating people. The Seamax LSA seaplane image shows me (still draped with or holding camera gear after doing a Video Pilot Report) along with very-talented Brazilian design Miguel Rosario (center) and William "Rocky" Roquemore (right), the generous owner of this flying machine who was kind enough to let me take his plane and receive about an hour's worth of flight instruction in handling Seamax on the water and in the air. Pictured nearby are aircraft reviewer, designer, and owner …three people essential to conducting a video pilot review. Of course this leaves out two other equally essential people. You also need a qualified CFI who knows the subject airplane intimately well and Russ Miley fit the bill perfectly. I've flown with a lot of other pilots and Russ performed his role exceptionally well. The final key player — without whom these videos you love would simply not happen — is videographer and YouTube channel owner, Dave Loveman. Thanks to all for their respective contribution. Here's to 2019 being a great year of flying for thousands of pilots around the world and a successful year of business for those who make the airplanes we love. Thanks to Tomas Brødreskift and the team at Equator for the home page and social media photo used to promote this article. As pilots clear the skies so Santa and his flying reindeer can go about their mission, it seems fitting to offer a word of thanks to all of you who have frequently visited this website. Our surveys show more than 65,000 Light-Sport Aircraft and LSA-like aircraft around the globe and we are proud to reach most of these pilots at some time every month. Pilots have often told me that I have the best job in the world and they may be right. Certainly I enjoy what I do and hope it shows on this website and in the hundreds of videos on which I have interviewed talented people or reviewed aircraft. See the best of them here and all of them (and more) on Light Sport and Ultralight Flyer. 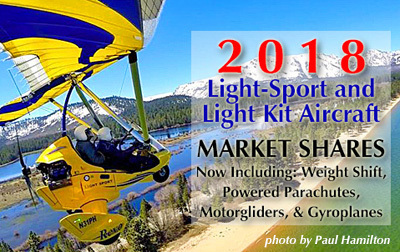 As 2019 approaches, we near the 15th anniversary of the Light-Sport category and the Sport Pilot certificate. Does Flying Around the Globe Sound Challenging? How About with a Chair? UPDATE 30 Dec 2018 — Sad news about a crash of one of the Handiflight aircraft with the loss of one of the pilots. See Comments. —DJ Imagine you are flying along in your well-maintained Light-Sport Aircraft with its reliable engine. 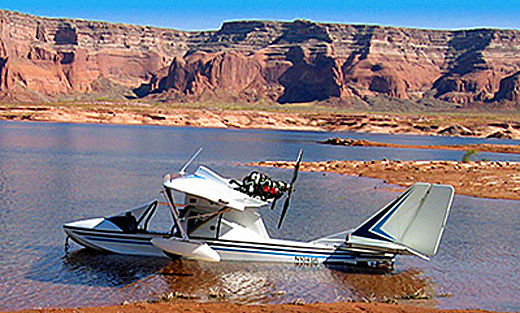 You are flying a long distance over all sorts of terrain, including vast stretches of water. All is humming along and the miles or kilometers are clicking past. What an experience to fly around the world! Very, very few pilots will ever tackle such a grand challenge. Then, the unexpected happens. Your engine quits. You have a plan. You trained for this and you are experienced. You leap into action. Imagine that you find an acceptable landing area but the location is very remote. That seems rather likely when flying all the way around the planet. Touchdown goes OK. The airplane is undamaged. You are fine. However, you cannot raise anyone on the radio and you are not sure your airborne mayday call was heard. You might trigger the ELT or other satellite device you brought but rescue means staying with the aircraft. Depending on the situation, that might not be optimal. Now… imagine all this if your means of moving around is by wheelchair. This adds a huge extra dimension of difficulty, even for a determined and fiercely independent person. What once was a daring aviation adventure could now become a battle on the ground. 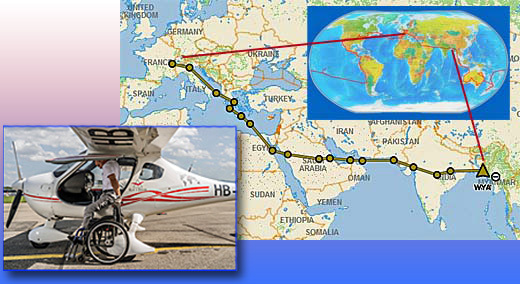 Beyond the monumental task of planning such lengthy flight, this and other emergency scenarios were surely contemplated by the pilot team from Handiflight as they prepared for their circumnavigation of the globe in twin CTLS Light-Sport Aircraft. Handiflight's goal is both simple and enormous at once: "A challenging and inspiring global adventure promoting the inclusion of disabled people and values such as commitment, fraternity, and fellowship." Handiflight 2018/2019 hopes to "contribute to changing people’s perceptions of disability and combating prejudices and exclusion" and to "turn dreams into reality, face new challenges, explore new pathways, discover new horizons by flying … across the most amazing and demanding areas of our planet. 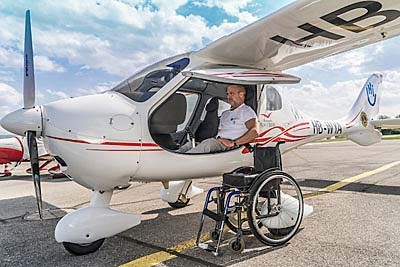 An additional goal is to "strengthen the global network of disabled aviators all around the world in collaboration with the FAI and local flying clubs." CTLS aircraft with call signs Whisky Yankee Alpha and WY Bravo set off on this expedition just a few days ago. Here is the planned itinerary for their nearly 50,000-mile voyage. 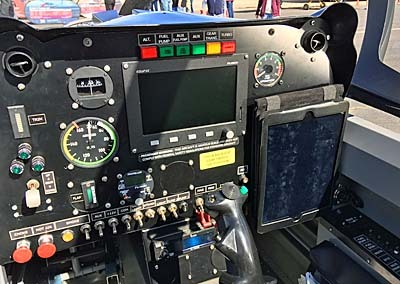 Hand controls installed on CTLS allow use of the rudder pedals by the handle (black) near the throttle (blue). As you might guess — and as has happened with several other such expeditions — the team is targeting a visit at Oshkosh with their CTLS aircraft. That should provide a wealth of media and pilot exposure for this brave team of aerial explorers. They also plan media interviews along the route. Handiflight shares Handicap International’s goal of combating prejudice and promoting inclusion by helping to change perceptions about disability. The Handiflight organizers said, "That’s why we have selected HI as our partner and the beneficiary of all the donations we collect." Lots of extra fuel is carried in a special installation in the right seat. As you celebrate the upcoming holidays with friends and family it might be interesting to track Handiflight 2018/2019's progress. And send good thoughts to the flight team that they do not have to land in some remote, unfriendly location. Imagine how good you have it as you ponder their immense journey. UPDATE 30 Dec 2018 — Sad news about a crash of one of the Handiflight aircraft with the loss of one of the pilots. See Comments. —DJ Imagine you are flying along in your well-maintained Light-Sport Aircraft with its reliable engine. You are flying a long distance over all sorts of terrain, including vast stretches of water. All is humming along and the miles or kilometers are clicking past. What an experience to fly around the world! Very, very few pilots will ever tackle such a grand challenge. Then, the unexpected happens. Your engine quits. You have a plan. You trained for this and you are experienced. You leap into action. Imagine that you find an acceptable landing area but the location is very remote. That seems rather likely when flying all the way around the planet. Touchdown goes OK. The airplane is undamaged. You are fine. However, you cannot raise anyone on the radio and you are not sure your airborne mayday call was heard. UPDATE 12/20/18 — Video added regarding the second book below. See at bottom of post… Unlike most aviation outlets, I've refrained from putting out a Christmas gift guide for pilots. I prefer to stick closely to aircraft as that's what you pilots want the most. I learned this lesson many years ago when I starting writing light airplane reviews and found a market that lead to this website. However, as a content creator I admire the work of other writers and in this post I have a couple for your consideration. Possible Christmas gifts or otherwise, these offer good wintertime reading when the snow flies and temperatures drop below freezing. Not many years ago, such a title would have provoked raised eyebrows or confusion. 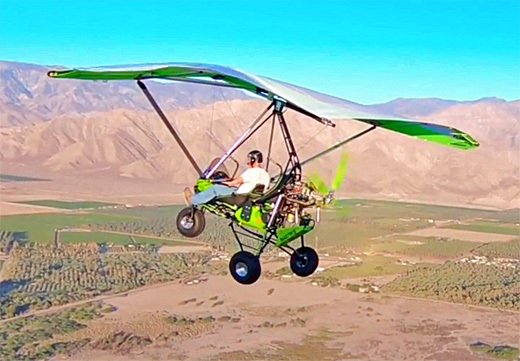 We didn't have any electric airplanes until around 2007 when Randall Fishman showed up at Oshkosh with his very credible single place (Part 103) trike ultralight powered by battery-supplied electric motors. But wait… is that right? The truth is, electric aircraft go way back, to even before the Wrights' famous flight 115 years ago. 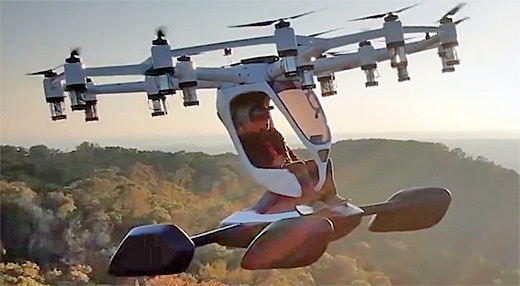 An article about the newest LSA candidate — a first Lighter-than-Air category — also uses electric power for horizontal movement but FlyDoo developer Leandro Corradini was far from the first. Back in the late 1800s. 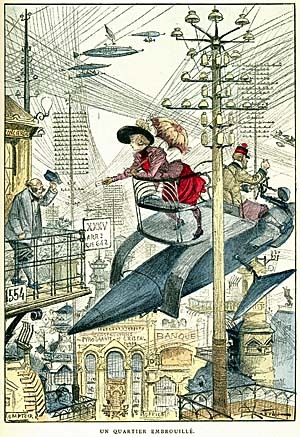 the earliest airships also used electric power, decades before Flyer's success at Kitty Hawk. Kevin Desmond demonstrates this most convincingly with his new book — "Electric Airplanes and Drones, A History." As the full title suggests, he begins with a historical perspective that imparted a slack-jawed look to my face. Kevin unearthed facts of early flight (real or fanciful) that I'd never heard or even imagined. With a vast range, Kevin's book goes literally from prehistoric times to futuristic developments and about everything imaginable in between. The 300-page book starts from the most foundational efforts to the invasion of electric motors on RC models, to solar power, to Lithium batteries, to the three Hs (hybrid, hydrogen, helium), to drones, to flying cars, and into tomorrow. 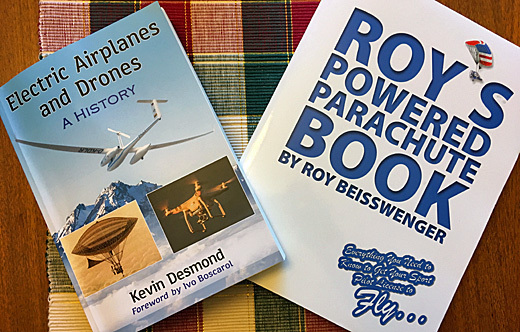 Based in France prolific writer Kevin (27 books and 300 articles) traipses all over the planet to follow developments of electric power on flying machines. Dense pages packed with information are accented with many illustrations, a couple of which are presented nearby. 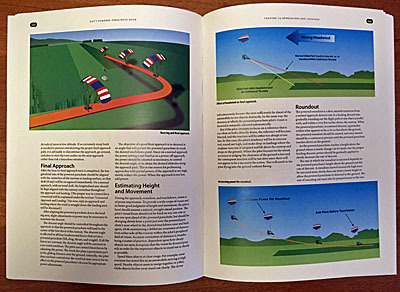 "Electric Airplanes and Drones" isn't cheap at $49.95 but it is a monumental effort describing the whole of the field in ways I have never seen documented. Bravo, Kevin! Get more info or order at McFarland Books. UPDATE 12/20/18 — Video added regarding the second book below. See at bottom of post… Unlike most aviation outlets, I’ve refrained from putting out a Christmas gift guide for pilots. I prefer to stick closely to aircraft as that’s what you pilots want the most. I learned this lesson many years ago when I starting writing light airplane reviews and found a market that lead to this website. However, as a content creator I admire the work of other writers and in this post I have a couple for your consideration. Possible Christmas gifts or otherwise, these offer good wintertime reading when the snow flies and temperatures drop below freezing. Electric Airplanes and Drones Not many years ago, such a title would have provoked raised eyebrows or confusion. 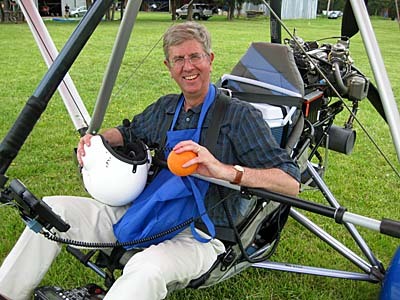 We didn’t have any electric airplanes until around 2007 when Randall Fishman showed up at Oshkosh with his very credible single place (Part 103) trike ultralight powered by battery-supplied electric motors. When Rotax debuted their new 915iS engine at an Oshkosh press conference, Sling designer Mike Blyth raced forward at the end of the conference to closely examine the new power plant. It was clear to me this answered a creation he had in mind and now we can see the fruit of his ambition: the new Sling TSi. 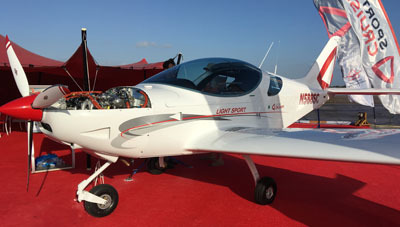 Since the Rotax 915iS remains a powerplant that requires an in-flight adjustable prop, it cannot be used on a Light-Sport Aircraft, but TSi is based on The Airplane Factory’s Sling 4 four seater so kit-built it must be. More on the builder effort below. For Oshkosh 2018, The Airplane Factory USA said, “[We are] excited to present the North American debut of the all-new Sling TSi! 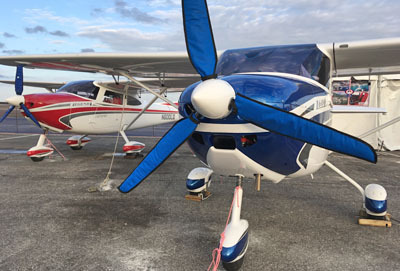 This kit is the airplane Sling fans have been waiting for!” The Southern California importer said TSi has all of the style, economy and practical utility of the Sling 4 but with more speed. 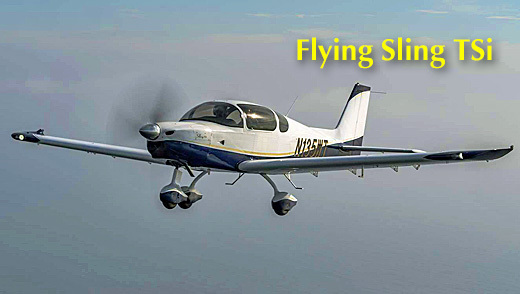 Harnessing the power of the new Rotax 915 turbo-charged, fuel-injected, and FADEC engine, Sling TSi can cruise at speeds up to 145 KTAS (167 mph) at 9,500 feet. Sling TSi has speed modifications not on Sling 4 including an all-new high-speed wing design that has been optimized for the power and weight of the aircraft. In addition, leading edges of the wing and forward fuselage and empennage are now flush-riveted for reduced drag. On the inside TSi has seating, ventilation, and heating improvments for passenger comfort and luxury. “Sling TSi was hands-down the hit of the show,” exclaimed The Airplane Factory USA. They reported one media outlet dubbed it the "Best New Sport Plane of 2018." 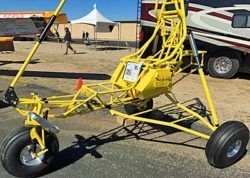 At an upcoming event at TAF USA’s base of operations — KTOA Airport in Torrance, California — the importer is closing a strong year by hosting one of their TAF Sling and Sling Flying Club Taco Social events. In addition to the Taco Bar treats (it is Southern California, after all, just a few miles from the Mexican border), attendees can hear about a most unusual Builder Assist experience. The “Main Event” will feature a presentation by Wayne and Matthew Toddun who traveled to South Africa to build their Sling TSi. 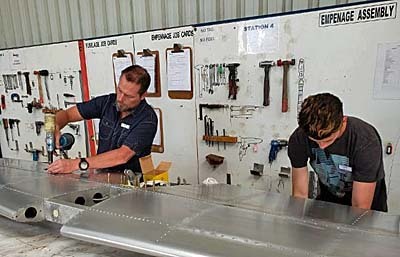 Not only did the father and son travel half way around the world to build their Sling TSi, the aircraft was subsequently re-assembled in Oshkosh and shown to visitors before it was flown back to Los Angeles. TAF said that according to Matthew Toddun, "When my dad decided to purchase a new Sling aircraft for us to learn to how to fly, he went for the very best, the brand new Sling TSi!” Matthew continued, “When he decided [to pursue] a build assist program, he wanted the best assistance that we could get.” ”That is when our life-changing opportunity came about,” related Matthew. “[We would] travel to South Africa to build the first conforming Sling TSi. We spent a little over two weeks working side-by-side with the experienced factory crew, learning the ins and outs of our new plane, and assembling it piece by piece.” It was this Sling TSi that was revealed at Oshkosh 2018. Once you’ve built or bought a Sling aircraft, you can travel to SoCal and be trained at TAF USA’s new New Sling Pilot Academy. TAF USA also announced, “Next Year we are starting the Sling Pilot Academy to help prepare pilots for the airlines.” However, If you’re not in Southern California or don’t wish to travel to Torrence, you have another attractive alternative run by a veteran flight trainer. 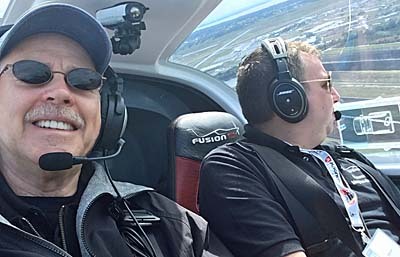 Paul continued, “We are also teaching private pilots in the Sling LSA and now we have successfully completed three Private Pilot training and checkrides in the Sling. Additionally, two CFI long-expired certificates were reinstated with Sport Pilot CFI checkrides per 61.427. The Sling has been a reliable and tough workhorse and everybody loves how it flies up in the mountains. Check us out here. When Rotax debuted their new 915iS engine at an Oshkosh press conference, Sling designer Mike Blyth raced forward at the end of the conference to closely examine the new power plant. It was clear to me this answered a creation he had in mind and now we can see the fruit of his ambition: the new Sling TSi. 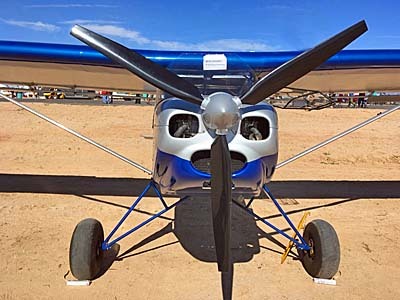 Since the Rotax 915iS remains a powerplant that requires an in-flight adjustable prop, it cannot be used on a Light-Sport Aircraft, but TSi is based on The Airplane Factory’s Sling 4 four seater so kit-built it must be. More on the builder effort below. For Oshkosh 2018, The Airplane Factory USA said, “[We are] excited to present the North American debut of the all-new Sling TSi! 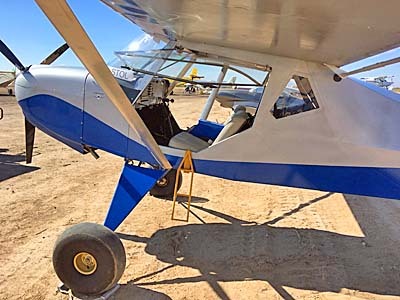 This kit is the airplane Sling fans have been waiting for!” The Southern California importer said TSi has all of the style, economy and practical utility of the Sling 4 but with more speed. One year ago, I was touring around China thanks to my good friends at AeroJones, the China-based manufacturer of the popular CTLS for the Asia-Pacific region. It was my second trip halfway around the world and I learned more about this country and its move to enter light aviation. 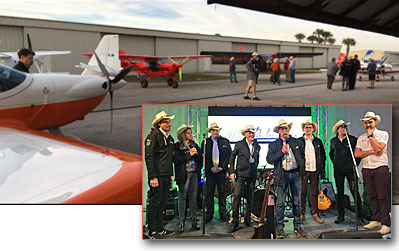 In this article, I want to spotlight the newest model of an all-electric aircraft called the RX1E, plus the very first kit-built aircraft in the country, and Continental Motors' support of another kit project. Xin Gou often reports via Twitter regarding Chinese light aircraft developments. Xin works with Willi Tacke, a well-known German publisher, electric flight enthusiast, and emerging China magazine entrepreneur. Xin and Willi work together on Flying China magazine. I actively follow Xin on social media where he is prolific posting items of interest to aviators. 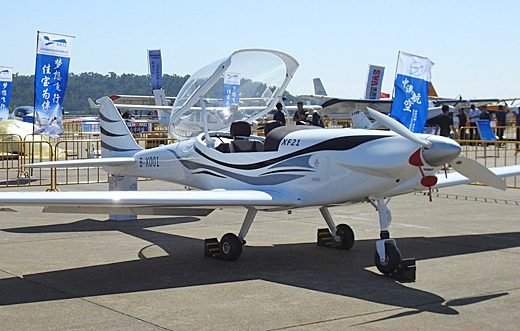 Reporting from the recently-concluded Zhuhai air show, Xin tweeted, "Liaoning GA Institute, China has upgraded their electric LSA called RX1E-A" — the "-A" denotes this change. "The brochure claims a two-hour charging time and a maximum duration of two hours." Both are worthy achievements. "The electric motor comes from a European supplier," reported Xin. 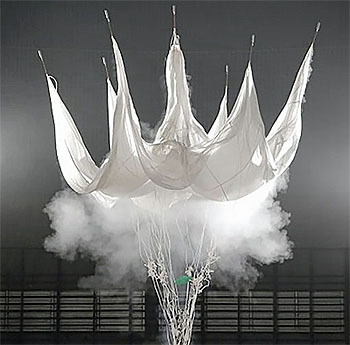 "Liaoning engineers have also installed a whole airframe parachute. The organization received 10 orders from a Chinese operator." Read more about electric aircraft, Willi, and Aero in this article from 2015, which includes coverage of RX1E. Xin also works with Willi to publish the e-flight-journal, which extensively reports these developments. I believe it to be the leading publication in this space. I reported earlier on the RX1E (without the "-A"). It was an impressive construction but in 2015 it was still a work in progress, according to representatives at Aero Friedrichshafen LINK in Germany. In the ensuing three years, Liaoning made several changes. Xin added in a subsequent Tweet, "I forgot to mention… a four seater fully electric model is also in development! 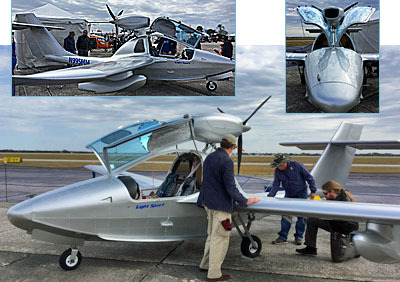 It will be quite different from this LSA model." 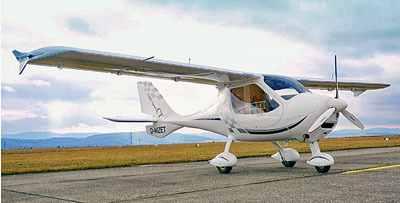 https://youtu.be/xtOPhu5gYVE For lots more videos about electric aircraft use this link to the Light Sport and Ultralight Flyer YouTube channel. 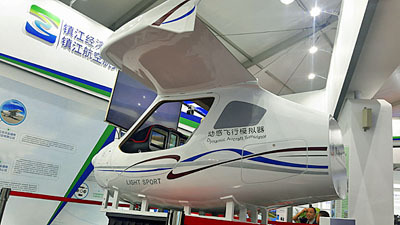 Besides the electric aircraft from Liaoning, Xin tweeted, "China is also opening the door for kit-built aircraft." While these have not been officially recognized until very recently, that is changing as the populous country cautiously embraces the ideas of private aviation. 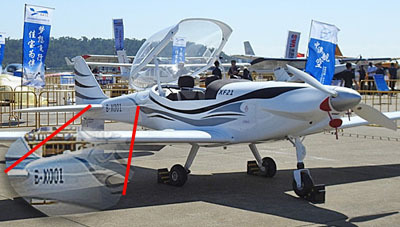 The nearby image shows the first experimental category aircraft in China. Approval was given to this aircraft from Europe. Note the "B-X001" tail number, Xin observes. "CAAC (the Chinese FAA) established the news experimental category in May 2018," reported Xin. "More kit-built airplane models will be built in China," he predicted. If you'd like to follow Xin on Twitter, search for @chineseflyer. His command of English is superb and he is a true aviation enthusiast reporting professionally on the growth of general and sport aviation in China. As noted, his work with Willi keeps him very in-the-know about electric aircraft, not only in China but around the globe. One year ago, I was touring around China thanks to my good friends at AeroJones, the China-based manufacturer of the popular CTLS for the Asia-Pacific region. It was my second trip halfway around the world and I learned more about this country and its move to enter light aviation. In this article, I want to spotlight the newest model of an all-electric aircraft called the RX1E, plus the very first kit-built aircraft in the country, and Continental Motors’ support of another kit project. 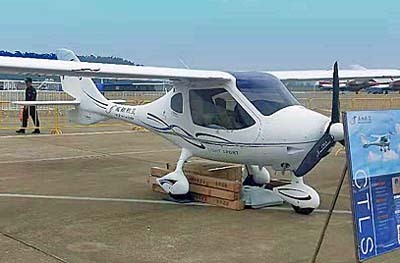 Electric Aircraft Upgraded Xin Gou often reports via Twitter regarding Chinese light aircraft developments. Xin works with Willi Tacke, a well-known German publisher, electric flight enthusiast, and emerging China magazine entrepreneur. Xin and Willi work together on Flying China magazine. I actively follow Xin on social media where he is prolific posting items of interest to aviators. Reporting from the recently-concluded Zhuhai air show, Xin tweeted, “Liaoning GA Institute, China has upgraded their electric LSA called RX1E-A” — the “-A” denotes this change.